In kata, one does not just do a series of techniques one after the other. There is a context, or baseline, within which the techniques are performed. There is stuff between the techniques - stuff happens before and after each technique. That in-between stuff in the interstices is zanshin. 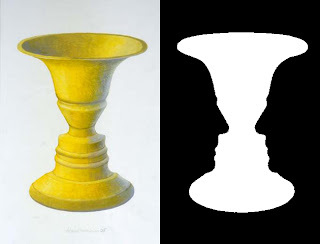 In art classes we talked about positive and negative space, an example being the black and white Rubin's Vase illusion above. Do you see two faces or a vase? Depending on what you want to call this a picture of, the spaces take on different meanings. If it is a vase then the spaces to the side are nothing - negative space. But if you want to say the faces on the side are the positive space (the thing itself) then the space in the middle is the nothing-space (the negative space). So, is the positive space (the thing itself) black or white? Kata is the same - where is the positive space and where is the negative space? Are you demonstrating techniques with mostly an uninteresting void inbetween, or are you demonstrating the interesting stuff in the middle being occasionally interrupted by a coincidental technique? Most people begin aikido concentrating on the techniques and ignoring the inbetween, but consider this... In life (real life) you might never have to ever do a given technique. That sort of diminishes the potential importance of the techniques, doesn't it? But the stuff in the middle - that is the stuff that you do all the time - all of your life. Getting up, walking around, observing people, keeping your mind straight. You live your whole life in the middle spaces with only the occasional interruption! That's zanshin! Zanshin is defining the stuff in the interstices to be the positive space of your life.